Einen schönen 2. Weihnachtstag ihr Lieben! Ich hoffe, ihr hatte schöne Festtage! 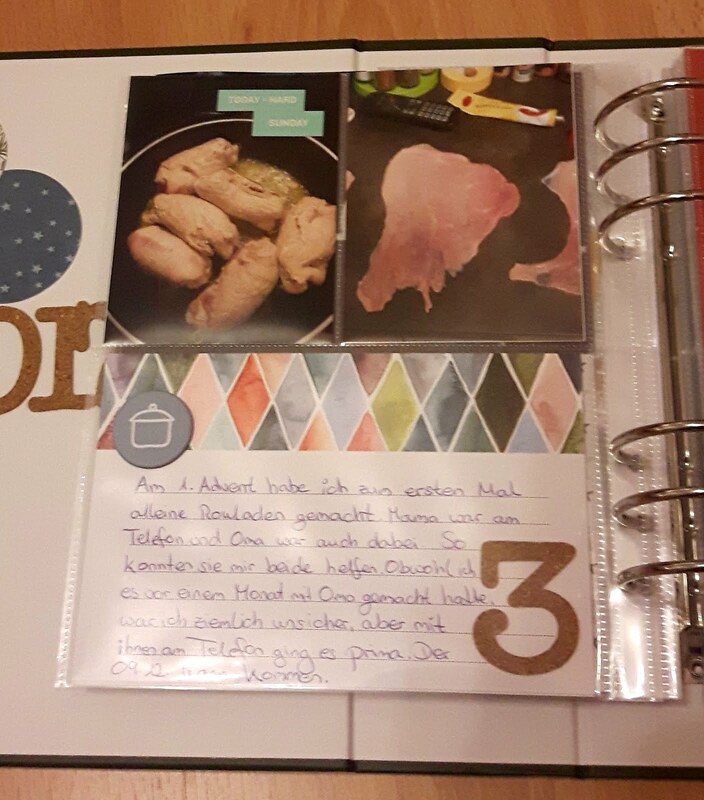 Vielleicht hat er die eine oder andere meine ersten sieben Beiträge meines Dezembertagebuchs verfolgt und ein paar Eindrücke bekommen, was ich so zu Beginn des Dezembers gemacht habe. Ich hoffe, wenigstens noch ein paar weitere Tage hier teilen zu können. Und wen es nicht interessiert, hier endlich wieder ein Beitrag zu "Gemeinsam Lesen". 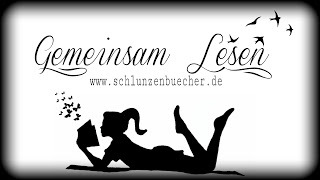 "Gemeinsam Lesen" ist eine Aktion von Schlunzen Bücher, die immer dienstags statt findet. 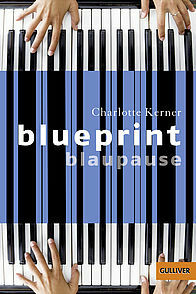 Ich lese gerade "blueprint - blaupause" von Charlotte Kerner und bin auf Seite 90 von 177. 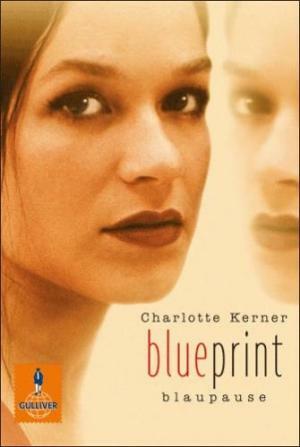 Das Cover mit dem Mädchengesicht ist eine alte Ausgabe, die, die ich gerade lese. Aktuell ist das Cover mit dem Klavier von Gulliver / Beltz. Ehrlich gesagt, mag ich mein Cover lieber. Es ist ein Buch, das mein Bruder bei seinem Auszug aussortiert hat. Eins, das er in der Schule gelesen hat. Ich fand es interessant und habe es mitgenommen. Es geht dabei um ein Klon-Kind und wird aus seiner Sicht erzählt. Es ist tatsächlich mal etwas ganz anderes und lässt sich gut lesen. 4. Weihnachten neigt sich nun schon fast dem Ende, was lag bei euch unter dem Weihnachtsbaum? (Frage von den Schlunzen). 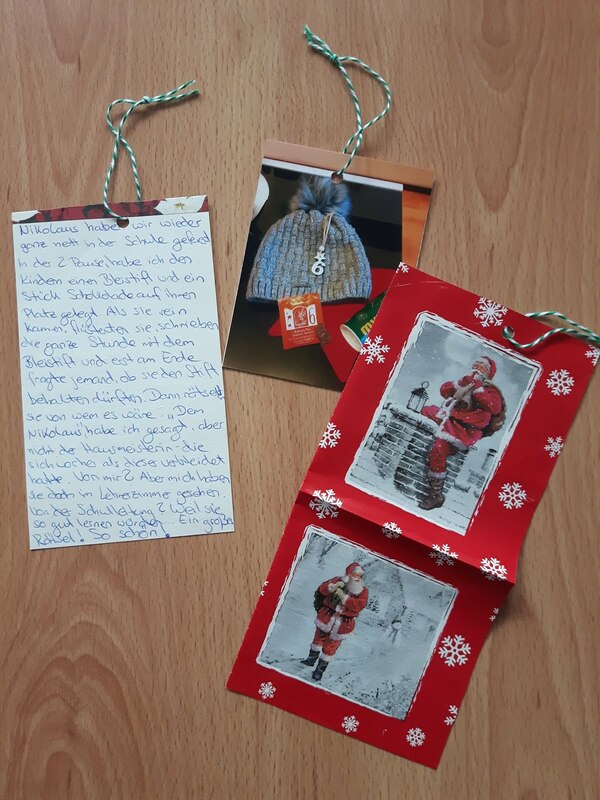 Bei mir lagen ganz verschiedene Dinge unter dem Weihnachtsbaum: "Flugangst 7A" von Fitzek in einer gebundenen Sonderedition, eine Rubbelweltkarte, ein großer Bräter, ein neuer Wasserkocher, ein Pulli und noch ein bisschen mehr. :) Alles wirklich tolle Geschenke, über die ich mich sehr gefreut habe! 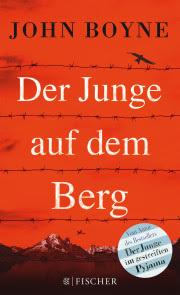 Buchrezension: John Boyne "Der Junge auf dem Berg"
Uff, die erste Rezension seit dem Sommer! Wie krass... das tut mir total Leid. Es gab viele Bücher über die ich schreiben wollte, aber nie dazu gekommen bin. Ich versuche mich 2018 zu bessern. John Boyne "Der Junge auf dem Berg"
John Boyne ist ein irischer Autor, der zahlreiche Romane geschrieben hat. Sein bekanntester Roman ist "Der Junge im gestreiften Pyjama" der in über 50 Sprachen übersetzt wurde und viele Preise gewann. Bemerkung: Dieser Beitrag wird aufgrund der internationalen Zielgruppe auf Englisch verfasst sein. For those of who, who don't know what this is about: December Daily® is a project by Ali Edwards, which gives the chance to document the month of December day by day - or however you wanna do it, there are no strict rules or rights and wrongs. Check her website and blog for more information, please. On Thursday, I was torn between using a filler story, as there are still some left to be told or really document what I did that day. I decided to document what I did: The first Christmas cookies. These are very quick and easy chocolate cookies. Cookies which can be done easily after work. And that's what I did. But because they are so easy and quick, I wasn't sure if I wanted to document it, but in the end, I decided there will probably be other days on which I really do not do anything Christmasy and I decided to write about the cookies. I used a filler card and added a huge transparent number 7 in one pocket. 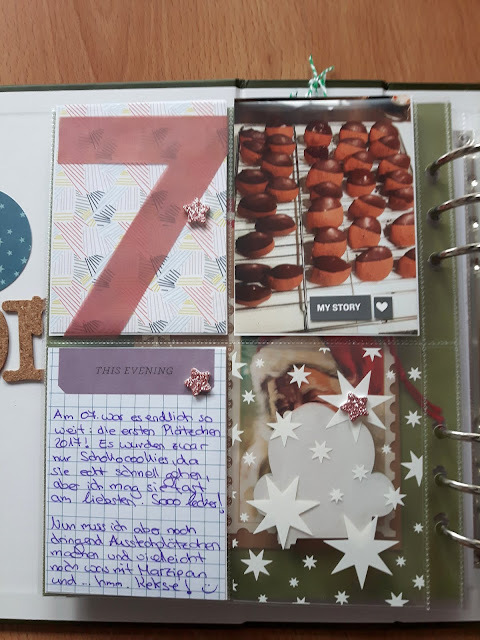 Next to it, I added a photo of the cookies and underneath the 7, I added a journal card, where I wrote about making them and how much I like these cookies. To decorate the page, I only used three pink glitter stars and the word phrase sticker "my story" plus a little heart. Yes, once again, I kept the decoration simple. I like it better that way. On the 6th of December, we celebrate St. Nikolaus here in Germany. That's what my story is about. I filled both sides of a tag with my stories. On one side, I wrote what happened at work (elementary school) and on the other side, I wrote about the gift I got from my parents. That's also what the photos are about. I got a set of green plates, bowls and a cup for breakfast and so on, but I didn't know from the beginning what my mum aimed for and her explanations didn't help much, either. So that's why I took various photos, trying to make it look like she was explaining.... It was so funny, that I dismissed the 2x2 page I had prepared and made bigger photos. 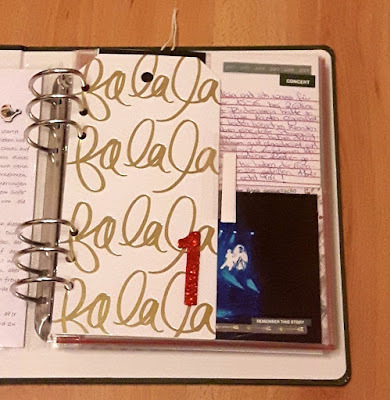 On the left, I planned to add a full size photo, but I didn't succeed to take a nice one, so I used a gold envelope instead, which I own since two years, always planned to use and never did. On top of it, I added a golden border and a very lovely Santa Clause tag, which I got with a Christmas Card these days. I loved both items so much, that I knew, I would use them immediately. In the top left corner, there is again a cork number. On the right side, there is a page protector with four 3x4 pockets. Three photos of my gift and me trying to follow mum's instructions - LOL - plus little white numbers from my stash and little puffy hearts from my stash. I followed the numbers when explaining on the tag what exactly I was aiming for. Seriously, this was hilarious. Some stories just happen without being planned. :D In the fourth pocket, I added a transparency that came with Jasmine Jones' mini kit this year and on top a layered sticker from Doodlebugs - a brand I love for their layered stickers. It's hard to get them in Germany, but I am always happy, when I find them. They are so cute! Inside the golden pocket, there is my tag with the journaling (I had to add washi on top, because I miss-punched it...), a photo of the content of my adventcalender,because I love the beenie so much, and a piece of the wrapping paper my gift was wrapped in, because I like the images of Santa. On Tuesday, December 5th, I didn't do anything Christmasy, so I needed a filler page. I decided for my Christmas tree story, because I had already done the layout on the right and needed a day on which the page protector turned out to be on the left. The idee for the layout with the Christmas tree on the right page, I got from Ali's "product play" class and from someone on Facebook, who altered the idea leaving out the stiching part. Ali used another shape, but after considering what would work best for me, I decided to go with the tree. It was really fun to put it together and I really like the result. On top of the tree, I added a pink glitter star from my stash and in the bottom right corner a cork #5 from a set Ali offered this year. 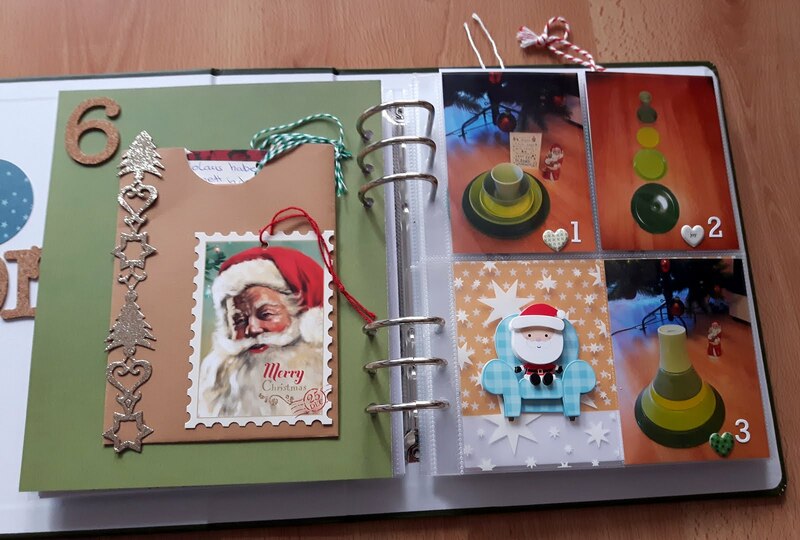 On the left side, there is the page protector with a small journal card, which says "o' Christmas tree" and shows a tiny tree. I liked this one so much, that I needed to use it this year. I wrote a bit about how I bought new Christmas ornaments this year, changing the colour of them. 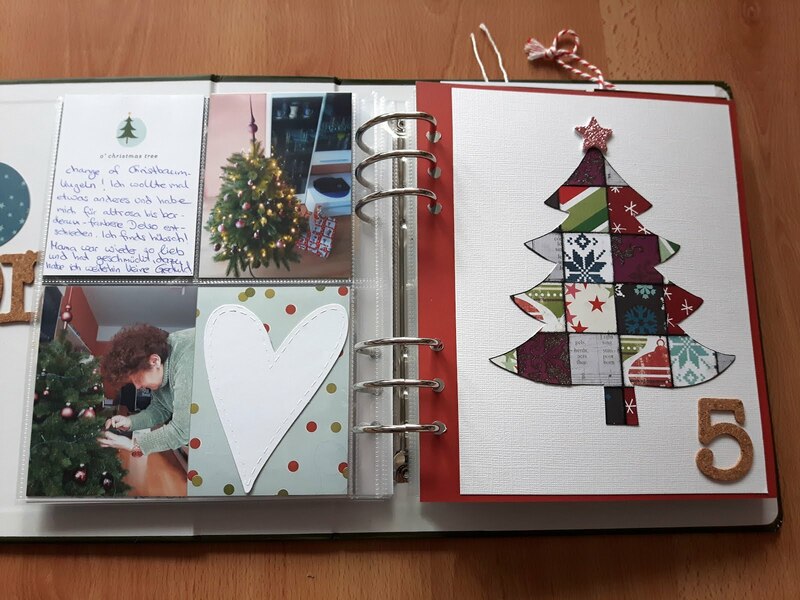 In the 4x6 pocket, I added a photo of my mum decorating my tree - though this happened at the end of November and a stiched paper heart from one of the story kits™. 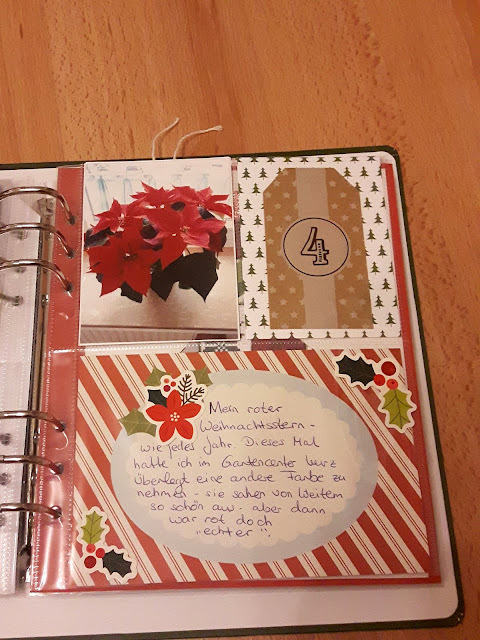 The background is the back of the journal card from Day 4. 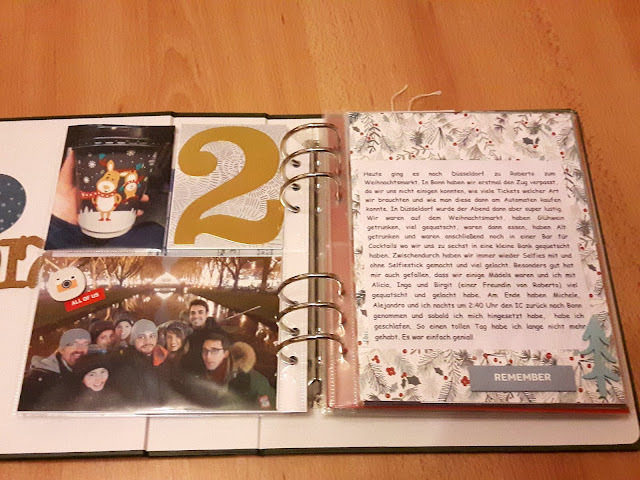 I really like how these pages turned out and I am happy that this year, I decided to add a photo of my mum decorating the tree, though it happened earlier. I already wanted to do so last year, but in the end decided against it, as it was not happening during my documenting December time. Mondays are my long and exhausting days at work, moreover, today I was not feeling so well anyways, so it was a perfect filler day. The last days, I took a couple of filler photos and today was the turn of my poinsettia plant, "Weihnachtsstern" aka "Christmas star" in German. Again, I used one of those page protectors, which have two 3x4 pockets and one 4x6 pockets. These are definitely my favourites. I only added one photo of my plant and a tiny bit of text on a 4x6 card. I was looking for another card, which I liked better, but couldn't find anything, so I went with this one and it's okay. I added three stickers, which fit the flower, on top of the page protector to make it look less plain. In the top right pocket, there is the back of a card, which I really want to use for day 5 and I was thinking, that the little trees don't really fit the plant, but then again I think they are cute... so I didn't cover them with another card. I just added a number 4 tag - which I got at a local shop. This was a very quick layout. Perfect for today and it gave me enough time to finish day 2 and 3, which needed their photos. I print them at a local store, so Saturday and Sunday will always have to wait. On Sunday, December 3rd, I stayed home and prepared some meat for a dinner next week. I decided to do it in advance and deep freeze it, to make it less stressful during the week. I prepared this meal for the first time, so I was on the phone with my mother and grandmother all the time - for hours! That's my short story for day 3. After using four pages on day 2, I only needed one for day 3. And I'm absolutely fine wiht it! I added two photos of preparing the roulades - one which also has the phone on it, 'cause it's a big part of the story. In the 4x6 pocket I added one of my favourite journaling cards from Jasmine Jones' kit and one of the cork numbers - which I love. I wrote a short story about preparing the meat and being all the time on the phone. I only decorated with two word strips "day=hard" and "Sunday", because this was really a big challenge for me. Moreover I added a chipboard sticker from the "eat" story kit™. And it was done! Quick and easy, but so important to me. I was considering about writing about it or ditching it and doing a "First Advent" story, but then decided that this needed to be documented. On Saturday, December 2nd, a group of friends and I went to Düsseldorf to meet another friend on the Christmas market. It was an amazing evening, so day 2 got a couple more pages. I thought about keeping it short and adding the rest to my Project Life, but then I decided that I loved the day so much, that I wanted to add more photos. On the first page, I added a group selfie and a cute cup from McCafé plus a big gold number 2 on a pattern journal card. I only added a camera sticker and the words "all of us" from the sticker bundle to decorate. I prefer less embellishment, as you will notice throughout my book. On the right side you can see a 6x8 pattern paper from the current Jasmine Jones mini kit as a background for my printed journaling. I usually handwrite, but when there is more text or I want to add more text on a small card, I type it down. This page, I didn't want to decorate at all, but then it did look kind of empty and I added a blue-ish tree and a "remember" - rubber piece to the bottom. These two as well as the other two stickers on the left page, I adhered to the outside of the page protector. That's something I have done in past every now and then, but want to try more this year as I like the idea of being able to touch things. Then there are two more pages for December 2nd. On the back of the 6x8 page, I glued a "friends" 4x6 card - as it was a great day with my friends - and another pattern paper 4x6 card from a past Story Kit™. As I had some white plastic stars in my stash, which look exactly like the cards on the card, I added them to the "friends" card. But this time, I glued them onto the card not the page protector, as I am not sure if they will really stick to anything the way I did it. Onto the pattern paper, I added a 3x4 part group selfie. I wanted to print a full size photo, but as we took them in the dark with the phones' front cameras, the quality isn't good enough to print them in 6x8. 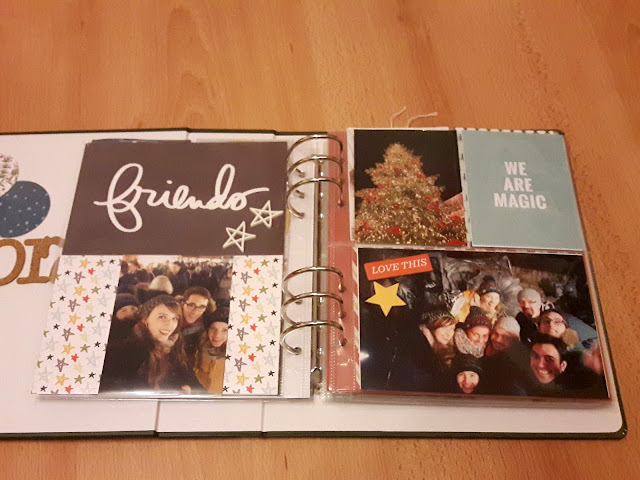 On the last page, I decided for a photo of a huge Christmas tree from the Christmas market, another group selfie and the "we are magic" card, which was part of the Documenter Kit by Studio Calico in September. On top of the selfie, I added a chipboard star and the words "love this", which kind of sums up the whole day. 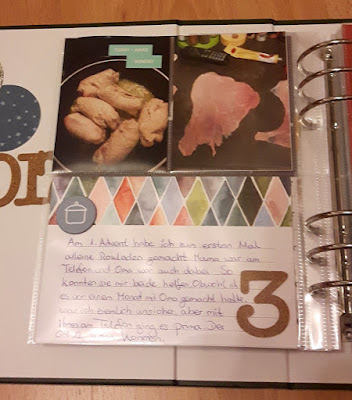 I usually write my blog posts in German as I mainly write about books nowadays, but as this will be shared for an international December Daily® group, I'm gonna write it in English. This is my fourth year doing this project, the second with Ali and her community and I will try to show you my pages throughout the month of December and probably the last pages in January, as I go home for Christmas and usually finish the project in January then. I document either from the 1st Advent or the 1st of December, depending on what comes first, till the 26th of December - which is the 2nd Christmas Day in Germany. So this year, I will be documenting December 1st till 26th. 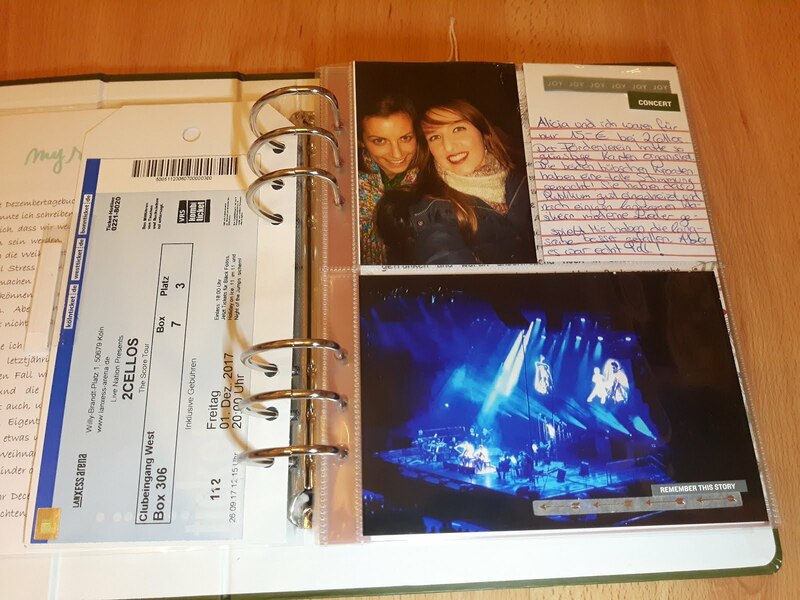 On Friday, December 1st, me and a friend had tickets to a concert by 2Cellos in Cologne. I got them for a great price, so we went, though only knew them from Youtube so far. And let me say, it was worth it! 2Cellos are really cool! 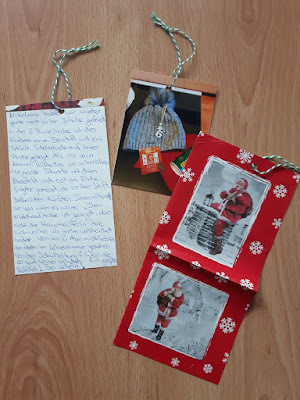 I used one of the big tags, we could order with our "give" story kit™ in November. The "falala" seemed to fit well with a concert. In the bottom right corner, I sticked a red glitter #1 and to the side an Avery Tag which I will write on, once my gold and silver pens arrive. :D I plan to write "2Cellos" on it in gold, so it matches the words on the tag. On the back of the tag, I sticked the ticket of the concert. Then I added a 3x4 selfie we took after the concert and a photo from during the concert - it's blurry and totally blue due to the lightning on stage, but I don't care. In the top right pocket, I added a journal card from Jasmine Jones' December Daily® 2016 mini kit. To round it up, I decorated it only a tiny bit with some washi-like stickers and two word phrase stickers.